Eye On The World: Yemen: Suicide bombers hit counter-terrorist base, kill 14, injure 40. Yemen: Suicide bombers hit counter-terrorist base, kill 14, injure 40. (Aden) A suicide attack today highlights the Byzantine nature of the war inside Yemen . The attack by Islamic state on the headquarters of a counter-terrorism unit in the southern port city of Aden on Saturday highlights killing 14 and injuring 40 shows how complicated the situation in the country is. On the side of the rebels we have Iran. They had the forces of the ex president on his side, but when they killed him off the other month, that saw his forces join the otherside. On the side of the official UN recognised Government we have Saudi Arabia and other gulf states. In between we have ISIS and Al qaeda. Then on top of all that we have the US which is fighting Al Qaeda.If that wasn't complicated enough the tribes of the south who were fighting the rebels on the side of the Government and Saudi Arabia, decided to make a play for power themselves and have carved themselves their own little caliphate under the remit of the separatist Southern Transitional Council (STC) who captured the port city of Aden and the surrounding area at the end of January 2018. 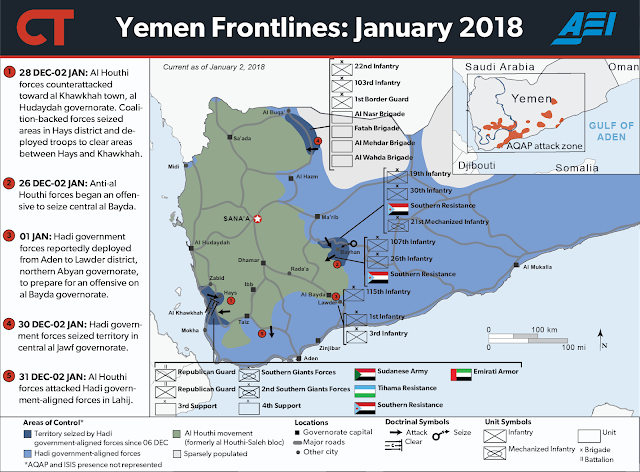 Islamic State, in a statement carried by its Amaq news agency, claimed responsibility for what it described as two "martyrdom operations" The attack was the first one of its kind in southern Yemen since the southern separatists took the city from the Hadi government over control of the city. Anybody else notice that a Sunni terrorist organisation which a lot of people claim is funded by Saudi Arabian citizens just happened to hit a town that used to be under the control of SA and its allies in an area that ISIS hasn’t shown its face for a while.